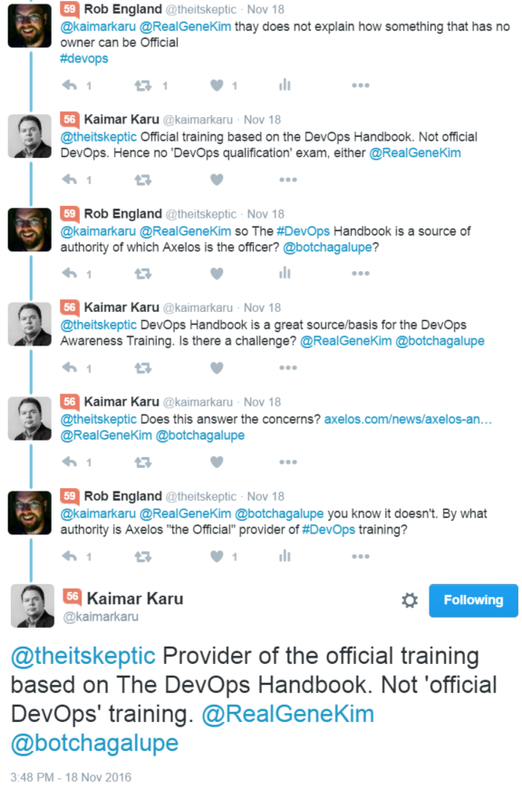 Axelos are the Official source of DevOps now? Imagine my surprise to discover at the recent DevOps Enterprise Summit conference that Axelos are now the official source of DevOps. BTW What was even more surprising was the total radio silence from some of the same people who were highly critical last year of the DevOps Institute providing training and certification in DevOps. Apparently it is less offensive for a for-profit corporate, owner of the dreaded ITIL, to be claiming "official" DevOps status. It is a shame that Axelos are doing good work such as the paper ‘Using Kanban in IT Operations’, written by Dominica DeGrandis, director of Training and Coaching at LeanKit, and Kaimar Karu, Head of Product Strategy and Development at AXELOS, and then they go and pull a stunt like this. Axelos are being highly disingenuous in trying to claim that the "official" refers to their relationship with IT Revolution and the DevOps Handbook. Putting aside the fact that it is unexpected that they would be given "official" representation of the DevOps Handbook content in an open content community (with the exclusivity that that implies), it is clear to any reasonable person that most of the population of the planet will be unaware of these subtle semantic distinctions, and will interpret the word "official" to indicate that Axelos are the authorative provider of DevOps content. See a more extensive discussion of this on DevOps.com.